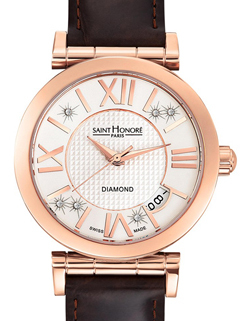 After the successful release of women’s summer collection Opera Piano “Summer Set” brand Saint Honore has released its version of the winter: “Winter Set”. Classic Quartz trehstrelochniki supplied with seven interchangeable colored straps: white black and brown – leather with crocodile print, beige, gray and purple – patent leather. As a bonus, represented black rubber bracelet. In addition to the six of diamonds, the dial is decorated with Roman numerals overhead, pattern “Clous de Paris” and an oblong box with a date at the level between the “4 and 5 o’clock.” The dial is protected by sapphire crystal. Round steel case with rose PVAD-coating is available in two sizes: 33 and 37 mm. Waterproof watch is 30 meters.